I don’t know if you have ever tried to bird with a cold, but it’s not easy. All your senses are dulled, which makes finding one of those fast-flitting warblers or other songbirds especially difficult. Still, we are in the midst of spring migration here in North Carolina, and I wasn’t going to let a little cold stop me from seeing some birds. My fiance and I arrived at the R. Wayne Bailey-Caswell Game Land a little past 2 p.m. Not exactly prime bird time, but the air was warm, the sun was out, and a light breeze made for perfect strolling conditions. 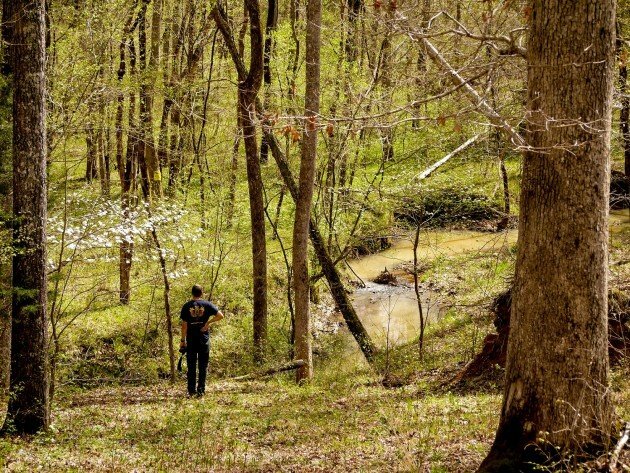 Certain areas within the Game Land are managed for American Woodcock and Northern Bobwhite, specifically perpetuating the secondary successional habitats they love so much. We began our walk through a field, watching the high grass for any interesting shapes. 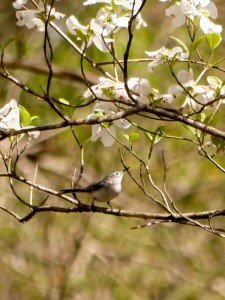 No luck with the quail or woodcock, but I was pleasantly surprised with how many birds I could hear bordering the meadow, and I entered the woods with high hopes. The trees are just beginning to leaf out, and the whole forest glowed that beautiful bright green you can only see at the very beginning of spring. The birds were high in the canopy, too high even for binoculars, but we kept walking slowly forward until eventually a few of them ventured down to check us out. Unfortunately for me, I was unprepared. Two blue-ish birds chased each other only twenty feet away, but for the life of me I could not focus on them with my binoculars or camera lens, and no amount of flailing could help me once they took to the treetops again. 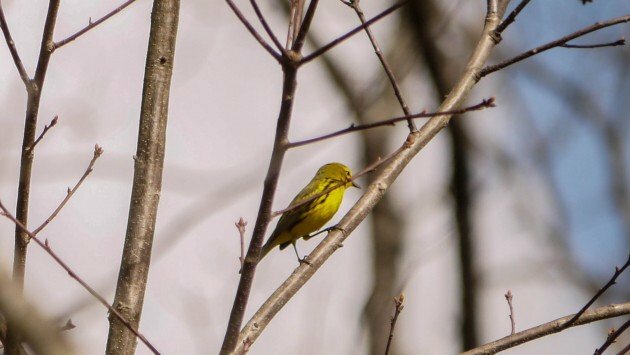 Another bright yellow warbler alighted only a dozen or so feet from me, but even then I couldn’t take a photograph, let alone reach my binoculars. Another birding fail. By this time I was frustrated. I had just missed two bird species, both of which were probably Year Birds for me, and I felt my cold dragging down my energy levels. Feeling my failure, I decided to momentarily shift from birding to butterflying. My subjects were all over the trail we were following, feeding on tiny wildflowers dotting the forest floor, and though they flit about their rapid movements were condensed to a few yards. Becoming interested in butterfly identification was a natural extension of birding for me. They are colorful, beautiful, and most active during the warmth of the day – exactly when birds become sluggish and hard to see. After purchasing an Audubon field guide to butterflies over the summer, I have slowly begun to learn a few species here and there. 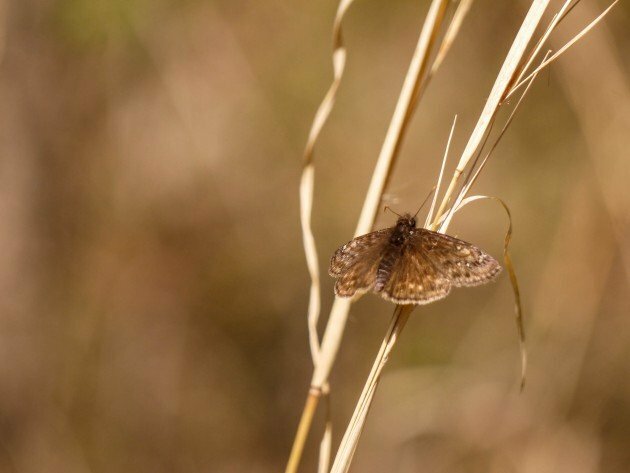 The gamelands proved to be an excellent place to butterfly that afternoon. Brown Wild Indigo Duskywings were everywhere, as were the tiny Eastern Tailed Blue butterflies, plus a Tiger Swallowtail or two. I saw over ten species and photographed five – three of which represented varieties I had never identified before. My confidence increased with my butterflying successes, and I remained alert for signs of bird activity. 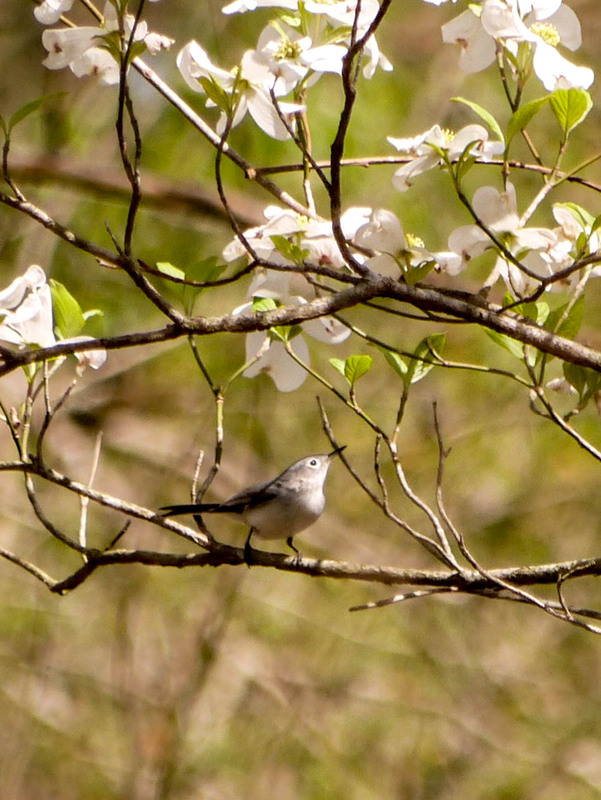 My first Year Bird of the day was a Blue-gray Gnatcatcher, framed perfectly against a dogwood tree and exactly the same species I had missed in the woods previously! Yes, score one for Erika. Add in a Yellow-throated Warbler, and my mood really soared. 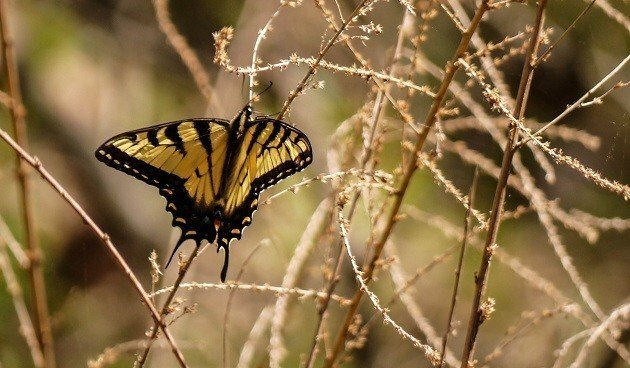 On a different tract of the game land, I was birding and butterflying happily when I heard a lovely rising song from thick bushes bordering the trail. I paused, spotting a few Common Yellowthroats, but I knew they were not the birds singing the beautiful climbing notes. Suddenly, a golden warbler with black streaks hopped to the top of a leafed out bush right in front of me! I had a clear mental snapshot, but I fumbled with the camera and before I knew it the bird had dived back beneath the safety and shelter of the bush. Now, if I had missed this bird only an hour or so before I would have clenched my fists in frustration, probably stomping a little on my way back to the car. But I felt the birding vibes were in my favor, so I waited, this time with my camera ready. Sure enough, the bird popped up a few minutes later on a young tree with no leaves, allowing me to see in perfect detail my very first Prairie Warbler! What started out as a slow birding afternoon turned out to be a coup not only for my Life List but also for my Butterfly List. Bring on the rest of migration season! Note: Whenever you bird on game lands, make sure to check the regulations and schedule, and be aware of special rules or hunting days. Robird: Effective Tool or Silly Scam?